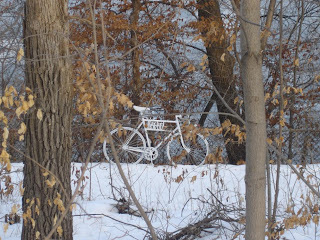 A Ghost Bike appeared on the West River Road earlier this week to commemorate Rachel Dow, a young woman who tragically fell through the ice on the Mississippi River in January. Reverborama posted this photo on MPLSBikeLove.Com and I moved a copy of it over here as well. On February 13th, the Amaury Sports Organization (ASO) barred Team Astana from competing in any race or event organized by the ASO in 2008. The ASO owns premiere cycling events like Paris-Nice, Paris-Roubaix, Paris-Tours, and the famed Tour de France. The ASO cited the doping scandals of last year’s Tour de France as justification. There can be no comparison between the Astana team of 2007 and the new Astana. The entire organizational structure has been rebuilt under the direction of the team’s new General Manager, Johan Bruyneel, who has thoroughly cleaned house. What’s more, Astana has adopted the rigorous doping controls developed by anti-doping expert Dr. Rasmus Damsgaard, and Astana now spends more money on anti-doping controls than any other team in the pro peloton. The ASO has turned a blind eye to Johan’s efforts. By barring the entire team from competing in ASO events, outstanding athletes like Levi Leipheimer, who was not a member of last year’s Astana team and who has never been implicated in any doping affair, are forced to sit on the sidelines while their life’s work passes them by. Help put Levi’s dreams back on track by signing the petition to Let Levi Ride. Petitions will be sent directly to Christian Prudhomme, Director of the ASO, as well as to VS, the official US media partner of the Tour de France. I upgraded today to a Park Professional, so I am selling my old, no frills Minoura truing stand. Nothing fancy but it works. Very reasonably priced for any bike lover that wants it. Comment if interested. UPDATE: I GET A SURPRISING NUMBER OF HITS ON THIS, BUT SAD TO SAY, IT'S SOLD. Good luck in you search and check out the Park stands - they are very nice. Click on the first photo to go to the Surly website and find our more about what makes this bike so different. It turns out that apparently, Blogger does not let you rotate a photo, so go ahead and grab your monitor and turn it over on it's side to look at the second the second "head on" photo. Be sure to return it to the original position when you are done. It made it to about 38 degrees today, which felt like heaven after so much cold weather. I managed to buy a very lightly used Surly Pugsley off of CL yesterday and got a chance to test ride that some more and take the Cross Check out for a spin as well. The Pugsley is fun to ride - for those of you that don't know this bike, it has HUGE tires. 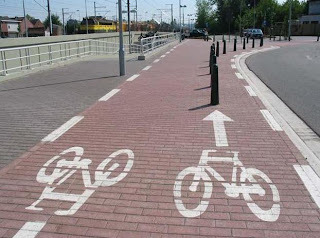 The bike was actually designed around the tires, which are 3.7 inches wide (a typical mountain bike might have 2 or 2.5 tires for comparison and a road bike tire is about an inche wide). The idea is that a large tire has more air volume and thus much less susceptible to pinch flats, so you can run it at a low pressure. 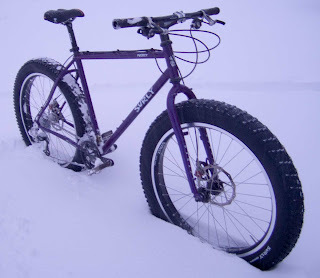 This gives you a bigger footprint (and yes, some more rolling resistance) but you can float on soft snow, mud, sand, etc. much better. It is very stable and not nearly as ox-like as you would think by looking at the picture. 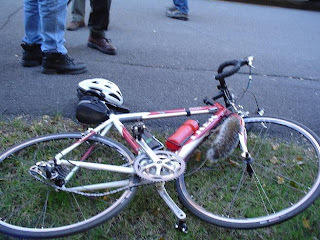 This is not my bike, but it's similar to mine. Because I am short, mine is a 16 inch frame, which exagerates the size of the wheels even more. It just looks so... wrong. There are all kinds on interesting design modifications that had to be made to the frame to accomodate the wheels and I am pretty impressed that Surly put that much effort into a bike. I'll post some more about the design mods once I get some picture of my actual bike so illustrate the modifications further. This afternoon I ran to the Hub for a bottle cage. The wind was pretty gruesome and you just had put your head down and pedal, but is was so much more fun to be out and on a bike than stuck in the basement on a trainer. Busy week coming up but looking forward to being in MPLS for the next week or so. Got back to MPLS about 5:15 tonight. Dinner at Pepito's and a preview of the Tour of California on the DVR waiting for me. Life is sweet. Photo is of a sunset (that was better experienced than captured on my cell phone camera) at the MSP airport about 5:30 today. Today took me to Fairbanks, AK for several meetings. We had an early flight out of Anchorage on AK Air and got into Fairbanks in time for breakfast. It's only an hour flight to Fairbanks but by road it is about 7 hours. 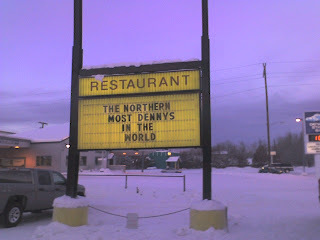 The Denny's in Fairbanks probably can lay claim t0 the most photographed restaurant sign in the world. 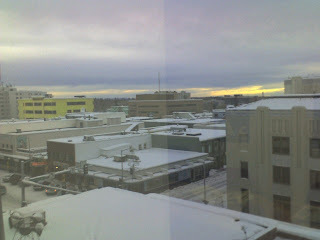 The second shot is from the 5th floor of the Key Bank building in downtown Fairbanks. Not much of a skyline, but I think you will agree it is beautiful in its own way. Got back to Los Anchorage by about 4:00, had a quick dinner at the F Street and packed. One early conference call tomorrow and I am off to Minneapolis for a bit. It's been two weeks up here and I am ready to return to normal life for awhile. I was locked in a project office in Anchorage for the last two days and have nothing to post, so I am going to visit the way-back machine and post on the Gray Menace. men·ace /ˈmɛnɪs/ Pronunciation Key - Show Spelled Pronunciation[men-is] Pronunciation Key - Show IPA Pronunciation noun, verb, -aced, -ac·ing. 1. something that threatens to cause evil, harm, injury, etc. ; a threat: Air pollution is a menace to health. Squirrels fit that description to a "T". Especially in Fall. They crouch on the side of the road or path, and then when you are too close, they dart across the path and nearly run under your front wheel. I have almost hit several of them, and seen several other close misses. If you think I am kidding, check the photos. These are dangerous and need to be stopped. 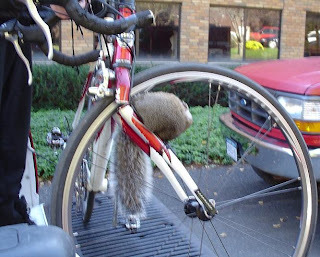 Be careful around squirrels. Do not trust them - they communcate and breed vigorously. Do not tust them. Molly and I slept in and then hung out in our old stomping grounds today. It was cold - about -10 when we woke up but we braved that and headed to airport park for a photo of Anchorage from a far. Water is steaming a bit, but you can see the ConocoPhillips builing (gold, tall on the left) the Atwood building (silver, tall, next to Conoco) and the steam from the MLP power plant outbound on the Glen Hwy. The second shot is from the new location of my favorite discount outdoor clothing store (Great Outdoor Clothing Co. or something like that). It's on Northern Lights and Spenard, down from the REI store. I scored a cheap balaclava and some heavy weight long johns for winter biking - all for about $30. Sweet. Molly joined me in Anchorage today - she came up on a frequent flyer ticket for a few days, which will make the stay that much more enjoyable. Tonight, after I picked her up at the airport, we had mediocre food and great beer at an Irish Pub down the street and then warmed up in the hot tub at the hotel I am staying at. We floated around in there for awhile, then jumped into the big pool, then went back to the hot tub several times. The lip of each pool is clad with aluminum, giving the hot tub a sort of swimming pool/autopsy table feel. Some scenery shots from earlier this week. 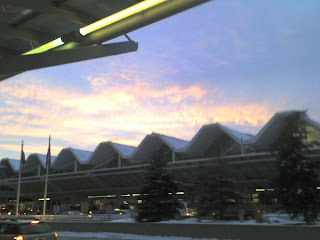 The first photo is from Point Waronzov, near the airport. The water is upper Cook Inlet, and Mount Susitna is in the background on the right. The tide change in Cook Inlet here is nearly 30 feet - that's second only to the Bay of Fundy and it's dangerous, cold and murky. The mud flats go on forever when the tide is out and getting stuck in the mud can be your last mistake. The second phots is taken from the parking lot of Flat Top, a popular hiking and skiing area on the upper hillside of Anchorage. The view faces west, toward Russia. You can see downtown Anchorage on the right of the photo if you squint. The airport is in the middle of the picture. It's still damn cold, but not as it was earlier in the week. I have yet to see a single bike rider, although there are a few bikes chained up outside of the ConocoPhillips office (including a nice Pugsley that is tricked out with handle bar muffs). The streets are icy, icy, icy. Studs are a must-have and not a nice-to-have here. The Darkhorse Coffee Shop in Anchorage has some of the best oatmeal I have ever had. 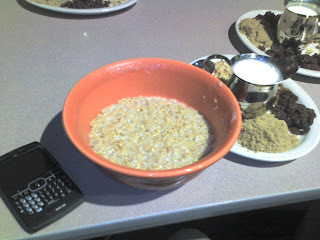 The bowls are huge (note Motorola Q to provide scale reference) and each bowl comes with a heaping mound of brown sugar, raisans, craisans, granola, wall nuts and some milk. We ate there just about every day this week and it was fabulous every time. Now when we walk in there, the women ask if we want "the usual". The best thing - all this plus a 16-0z. coffee is $6. Sheldon Brown passed away this week and the bicycling world is currently mourning our loss. Sheldon was literally an encyclodia of bicycle information, and his shop, Harris Cyclery in Newton, MA is a household name in citys thousands of miles away from Newton. Sheldon had compiled an extensive on-line reference source on bikes, bike repair, and anything else cycling related that you can think of. It was one of the first links I put into the "links" section on this page since it is so useful. Sheldon is probably the one person most responsible for my wanting to build a fixed gear bike. 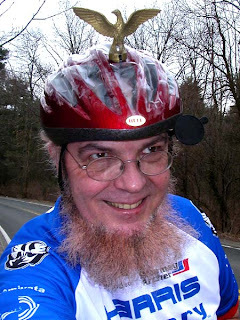 He was also very accessible and one of the most helpful on BikeForums.Net. He would often post a response or forward a link to solve a problem but never once came across as a know it all or lost patience with a forum member that I saw. Not sure how to end this, but rest assured that we will all miss you, Sheldon. On day three in Anchorage now. We got into town on Sunday at about 2:30 PM, got our bags and hopped in the rental car for some quick site seeing before work began on Monday. We made it to Girdwood and had some fantastic views along the Seward Highway south out of Anchorage. It's been really cold since we got here (I know - it's Alaska and it's winter, but it's not usually this cold). Here is a photo of the Anchorage skyline (as it is) from my hotel room. This looks north towards Knik Arm (the water in the background. The tall building on the left is the Captain Cook Hotel. I will be up here for another week and a half. I get any better pics I will post them, but now, that's what I've got. I love it. It looks like it got whittled from a solid chunk of steel. Sharp edges and machine marks all over. 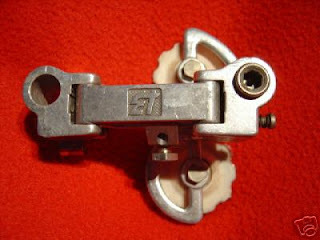 Not a very close copy of a Campy derailluer, however. I wonder how poorly it shifts? For 12 bucks it would probably be worth it to buy this thing just for the novelty of it. 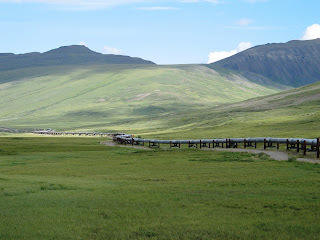 I need to head up to Anchorage for about two weeks to do my part for North American energy security. I will bring the camera and post a few photos if I find the time. The Fur Rondy does not start until later in the month, so I will not be able to post any sled dog racing photos, but maybe I can get some city moose or something. In the meantime, here's some scenery shots from a driving trip from Fairbanks to Prudhoe Bay and back that I made back in 2006. The first photo is in the rolling hills north of Fairbanks but south of Coldfoot. 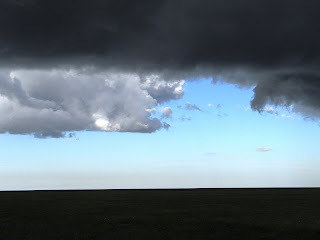 The second is a threatening sky just south of Prudhoe Bay. Enjoy!